Compare Car Insurance For Cheap Quotes! It’s quick and easy to compare cheap car insurance quotes online with Compare Insurance Ireland. Simply complete the above form with your details, vehicle type, driving history, policy and additional driver details if required. Once you have added this information, select “Quote Me Now” to compare the best car insurance deals. We compare quotes from AXA, AIG, Aviva, Allianz, Kennco, RSA & Wrightway to name just a few motor insurance providers. Our mission is to find you the cheapest car insurance policy. The insurance industry in Ireland is fiercely competitive, you may be surprised at how much you can save by shopping around. Compare motor insurance prices today and buy online! We have drawn up a list of cheap car insurance tips below to help you get the best deals. It is essential to know what to look for when buying car insurance. This guide should give you a better understanding of how insurance works and what you can do to reduce your premium! If your vehicle is older than 10 years you could look at downgrading your car insurance policy from comprehensive to third party fire & theft. You may be eligible to avail of a discount if you take alternative transport to and from work rather than using your car. In some circumstances the insurance provider may request evidence of a travel pass or tax saver commuter ticket. If you increase the excess limit on your car insurance policy this may help to reduce your premium. The excess limit is the amount you contribute towards the cost of the claim. Consider adding your partner, wife or husband to your motor policy as this may reduce the price of your premium. You may qualify for a discounted premium if your partner, husband or wife has a car insured in his or her own name or uses a company car. If you have recently changed your job or career to a role that involves less driving this may help reduce your insurance premium. Certain occupations are categorised as high risk, mainly those that involve a lot of annual mileage compared to a job working in an office. Ensure you cover your vehicle for the correct value, as this will affect the cost of your annual premium. If you have over valued your car you may be paying too much alternatively if you have undervalued your car this may give rise to issues in the event you need to make a claim. As little as a €1,000 difference in the value of your car may put you into a higher threshold category. If you are in doubt please give us a call and we will be delighted to help with your query. What is a step back bonus? 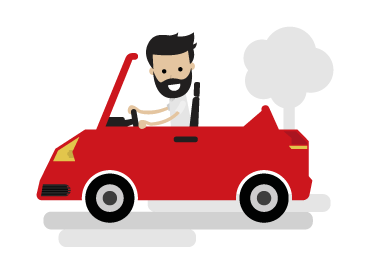 “Step back bonus” is a benefit that you can add to your motor insurance policy that may allow you to retain a portion of your “no claims bonus” in the event you need to make a claim. Criteria may vary depending on the insurance company. If you decide against this additional benefit it may reduce your insurance premium. Although we would suggest you add the “step back bonus” to your policy as it may save you money on your premium should you need to make a claim in the future. The higher the number of years your motor policy remains claims free the better chance you have of availing of a cheaper premium compared with someone that has made a number of claims over the past few years. If you are considering switching your insurance, ensure the new provider will accept your full no claim discount. Vehicles with immobilizers and alarms may avail of a discount compared with those without. If your car does not have an alarm we would recommend getting one fitted by an approved garage. Some insurance providers may offer a discount on your premium if you park your vehicle in a secured garage rather than on a public street. Review the options to see how much you can save. If you are in the market for a new or used car we would suggest shopping around for a quote before purchasing. Please note; the insurance premium will be based on the size of the engine and price of the vehicle. Consider buying online as some insurance providers may offer discounts for web based sales. Always read the terms and conditions carefully. The best way to reduce your motor insurance premium is to shop around. Ensure you are comparing like with like and always read the terms and conditions carefully. We hope you found our car insurance tips useful and informative. Car insurance Ireland FAQ’s. These FAQ’s will give you a better understanding of how car insurance works, helping you to make a better and more informed decision before you purchase a policy. How soon will I be insured to drive? Provided the insurance proposal has been approved and payment has been made, cover can be put in place immediately. When will the insurer send out my insurance Disc and Cert? The insurance company will send out the policy schedule, insurance disc and cert within 7 working days of purchase. The insurer will require a signed proposal and confirmation of your no claims discount. Do I receive a replacement vehicle in the event my car breaks down or is being repaired? Insurers will generally offer a replacement car while your vehicle is being repaired, however this will depend on the insurance company. Always read the terms and conditions carefully to ensure you understand the criteria. In the event you need to make a claim, you will have to pay an excess amount towards the cost. This will be outlined in your policy, excess limits generally range from €100 to €500. For every year that you do not submit a claim you will get a discount, generally up to 5 years. Is there cover that will protect the no claims discount? Yes this cover is available, the benefit can be added to your policy for an extra premium. This cover is generally available when your car breaks down or will not start. You will need to contact the insurance company, they will send out a mechanic to take a look at your vehicle. If the mechanic is unable to repair your car they will tow it to the nearest garage and help you to complete your journey. Always read the terms and conditions carefully, as criteria may vary from insurer to insurer. This will depend on the type of policy you have. If your keys were stolen from your house by burglars most insurance companies will contribute towards the cost of replacing the locks on your car. Always read the terms and conditions carefully. This will depend on the level and type of cover you have in place. What type of claims are excluded? Wear and tear, routine mechanical faults, loss in value, tyre damage or punctures, parking fines, parking clamps and Garda fines are not covered. Windscreen cover is generally included automatically under Comprehensive policies and can usually be added for an additional premium to Third Party Fire and Theft policies. This benefit will cover windscreen damage. Yes, but conditions and limits may apply. Phone the car insurance provider directly to find out what details are required. You will have to report the incident to the Gardai immediately. Take a note of the other vehicles registration number. Remember to exchange names, addresses, insurance policy number, driving licence details and the names of any witnesses to the accident. If you have a smart phone or camera take pictures for your own records should the insurance company or Gardai require them. Notify the insurance company as soon as possible and disclose all details of the accident. If you receive third party correspondence, all letters and notices must be sent directly to the insurance company. It is advised that you do not enter into talks or return correspondence until first talking to your insurance company. What do I need to do if my car is stolen? You need to contact both the insurance company and the Gardai as soon as possible with full details. If my keys are in the ignition and my car is stolen am I covered? No, if the keys were left unsecured or unattended there will be no cover available. What should I do if somebody wishes to claim from me? Contact your insurance provider immediately, the customer support team will be happy to go through the details. If I accidentally crash my car or it is a write off, how much do I receive? Depending on the type of policy you may receive the current market value for your car less the excess amount. When you purchase a policy the claims phone number will be displayed on your documents. Alternatively you can contact the insurance provider directly and ask to be put through to their claims department. Customer support will guide you through the claims process. What if I am refused motor insurance? If you are refused car insurance by 3 or more insurers you can contact the Declined Cases Committee of the Irish Insurance Federation. They will provide you with details in relation to your options. We would suggest that you become familiar with the different types of policies available before purchasing car insurance online. There are 3 main types of motor policies, third party, third party fire & theft and comprehensive. You will need to consider the type of policy that best suits your requirements, this will depend on a number of factors such as value and age of the vehicle, cover levels and the premium. Cars with a low market value. Young drivers under the age of 25. Drivers with no driving or claims history. Drivers living in a high risk area. Third party fire & theft will generally insure you for the above benefits plus damage to your vehicle for theft and fire. Damage or theft to personal belongings – items stolen from a locked glove compartment or boot. Cover for driving another persons vehicle, provided you have their permission. Car insurance quotes and policies are provided by O’Callaghan Insurances. Automated decision making; if in the event that you would like a decision reviewed please phone the above number to discuss. Thank you for visiting our car insurance comparison website, we hope that you were able to find the best value cover at a competitive price. Drive safely!